The Anti-Irish Sentiments of H. P. Lovecraft - Charley Brady - Opinons; My Own. Well now, I’m not the better for that! In fact, I’m almost sorry that I came across this correspondence from 1918/20. 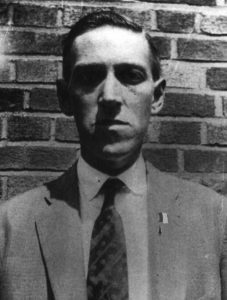 You see, I’ve been a lifelong devotee of the writings of Howard Phillips Lovecraft (1890 – 1937) of New England. When I was a schoolboy in the 60s and 70s he was pretty much a fringe writer; but today, entire academic treatises are devoted to him. Indeed, he is now regarded as an exponent of weird fiction on a par with fellow American Edgar Allan Poe. To my mind he surpasses Poe, but that’s another day’s work. And, although unknown to any but a handful of enthusiasts during his lifetime, from our vantage point his enormous influence on 20th and 21st century imagery simply can’t be denied, the word ‘Lovecraftian’ having entered the language and with even mainstream writers such as Joyce Carol Oates and Gore Vidal casually mentioning his work, with every expectation that his name will be recognised. From the little I know of John Thomas Dunn (1889 – 1983), he seems to have followed his own principles. When he refused to register for the draft he was sentenced to 20 years in prison, but was released after WW1 and became a Catholic priest. Just one of those little snippets of history that continue to fascinate. 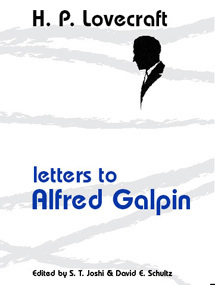 It’s a pity that Galpin’s side of the correspondence hasn’t survived, as I would have liked to see it. It’s difficult for me to read this. As I’ve said, I’ve had a lifelong admiration for the fiction of HPL; and in fact I contribute articles on him to the excellent ‘Lovecraft eZine’; but, ye gods! This makes for uncomfortable reading. It also confronts me to an extent with my own hypocrisy: I’ve known for years that Lovecraft was a racist and a rabid anti-Semite. Nor is this something that can be argued against by saying that he was a product of his time. His rants go well beyond that. Yet I felt it was just part of his enormous complexity as a human being. After all, he seemed to be an equal opportunity hater. It’s not as if he stuck to just belittling any one particular race: he didn’t like human beings in general, even intensely annoying me by dismissing the brilliant poet Robert Burns as ‘an overrated Scottish peasant’. And he had Jewish friends who liked him and tolerated his views. He even married a beautiful Jewish woman, Sonia Greene – hell, I can only think that she was a living saint for putting up with him for even two short years. I doubt they felt short to her. Complex wasn’t the word for this man who could be so incredibly kind and generous with his time to younger writers, no matter their race or background. And to be fair, his extreme views softened somewhat towards the end of his 47 years on earth. Yet simply because it is so close to home for me, the above excerpts – and there are lots more — have hit me hard. And whilst I will always admire H. P. Lovecraft’s fictional output, there is no doubt that this will colour my view of his work. Yes, I’m almost sorry I came across it; but it is important to examine those you have admired and to see them for what they are.